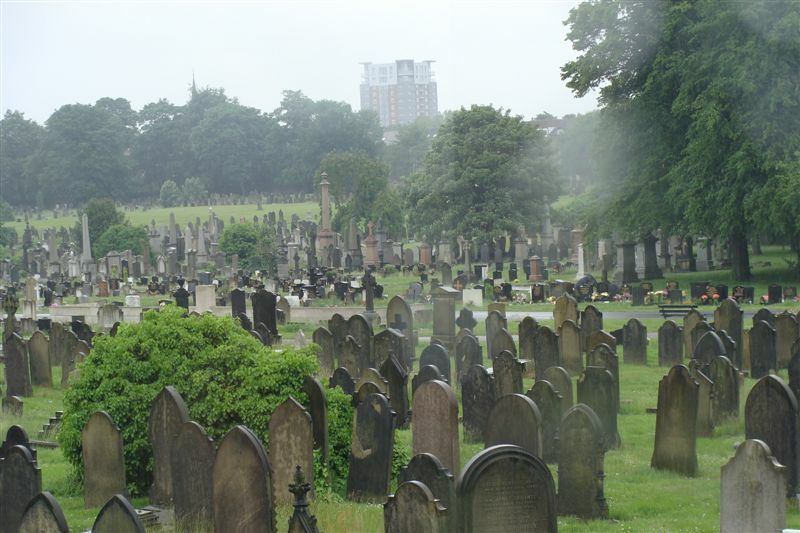 LIVERPOOL tourist chiefs are hoping to attract tourists - by promoting the city's graveyards. Cemeteries like Paris's Pere Lachaise and London's Highgate attract thousands of visitors. Liverpool may not be able to boast a Jim Morrison, but it does have 60's crooner Michael Holliday. And while Highgate is the well-known final resting place of Karl Marx, Liverpool has its own renowned socialist writer. Who lies in a Liverpool's Cemetaries then? William Taylor Barry - United States senator, Governor of Kentucky and Postmaster General of the US. Sarah Biffin - armless dwarf artist who painted portraits of British monarchs and befriended Charles D!ckens. Edward Rushton - blind anti-slavery campaigner. Formed the Liverpool School for the Blind. Captain John Oliver - served on the Victory with Nelson at Trafalgar. Captain Elisha Lindsay Halsey - stabbed to death by his ship's cook, John Kent of Liverpool, who successfully pleaded self-defence. Catherine 'Kitty' Wilkinson - set up the first city washhouse as a cholera epidemic raged. William Harrison - first captain of the Brunel-built iron ship the Great Eastern. The main mast stands out-side The Kop. William Lynn - father of the Grand National. A mausoleum marks the final resting place of William Huskisson, Liverpool MP and the first person to be killed by a train when run over by Stephenson's Rocket at the opening of the Liverpool-Manchester line in 1830. Robert Tressell - writer of The Ragged Trousered Philanthropists. In August 1910, he travelled to Liverpool to arrange passage to Canada, but he was admitted to the Royal Infirmary where he later died of TB-related illnesses. He was buried in Walton cemetery in 1911, opposite the prison, in a grave with 12 other 'paupers'. The grave was not located until 1970 when money raised by local socialists paid for an engraved headstone, now badly weathered. James William Carling - illustrated many of Edgar Allen Poe's works. James Glanister - survived The Charge of the Light Brigade. There is also the grave of a man killed on the Titanic. Michael Holliday - singer in the 60s who had a number one hit with Story Of My Life and provided the voice of sheriff Tex Tucker from the series Four Feather Falls. Buried under his real name, Norman Alexander Milne. James Maybrick - cotton merchant suspected of being Jack the Ripper. His wife was convicted of his murder by poisoning. William Wallace - "The Man From The Pru" successfully appealed after being found guilty of the murder of his wife. The murder remains a mystery. Michael James Whitty - first head constable of Liverpool police and fire brigade, went on to found the ECHO's sister paper, the Daily Post. Some famous names in Anfield include Alf Garnett, Jimmy Tarbuck, Tommy Cooper, Billy Connolly and Jimmy Hill though they are not the celebrity ones. There is also a young man called Dolphin Fish. James Dunwoody Bulloch - Shipping agent for the confederates in the American civil war who bought ships built in Lairds. James Picton - architect and surveyor who gave the city Wavertree's Picton clock. Samuel Graves - famous Liverpool MP commemorated by a statue in St George's Hall. Sir John Bent - owner of Bents' brewery. If I ever go to London again, I'd love to visit Highgate. St Jame's is nice too when there not littering it. The Huskisson tomb is badly full of litter! Been near Anfield cemetry but never seen Maybricks grave which has been damaged because people believed he was the ripper! HIS blood-curdling crimes and mystery identity have made him one of Britain's most notorious killers. But some experts believe Jack the Ripper was a Liverpool cotton merchant at the centre of a Victorian scandal that changed the future of British law. James Maybrick died from alleged arsenic poisoning and his wife Florence was convicted of his murder. Since then, however, her guilt has been in doubt, while he has become a prime suspect in the Ripper murders. A guided tour around Liverpool, stopping off at the couple's old haunts, has been launched for those interested in finding out more about the mystery. Appropriately it began on Grand National weekend - a key date in the Maybrick scandal. It is believed it was at Aintree the couple had a row that may have sparked murderous intent in both. Lesley Delves, tourism project manager at Liverpool Culture Company, said: "It is a fascinating case, particularly in light of the Jack the Ripper connections and there is a lot of local interest. "Maybrick had the motive and the opportunity to be Jack the Ripper. "We wanted to launch it to coincide with the Grand National because the couple had a huge row there that may have led them both to murder." Diaries claimed to belong to James Maybrick were discovered in 1992 filled with supposed confessions to the string of horrific prostitute murders. The authenticity of the diaries is still being debated by "ripperologists" and forensic experts and opinions vary. But Maybrick was also the apparent victim of a murder himself which resulted in the country's most sensational court trial of the time, held at St George's Hall. His wife, a young American, was accused of poisoning him with arsenic extracted from fly papers. Mysteriously, although a well-known arsenic addict, exhumation of Maybrick's body showed no traces of the drug. In 1889, she was sentenced to be hanged to public outcry, but the sentence was dramatically changed to life imprisonment four days before her date of execution. Despite numerous appeals, Florence remained in prison and was released after 15 years, dying in obscurity in Connecticut, in 1941, at the age of 79. The outcome of the case caused a public outcry. Justice James Fitzjames Stephen who presided over the trial of Florence was a well-respected official until his handling of this trial, but was, only a few years after the verdict, confined to an asylum as a result of his mental incapacity. In 1907, Britain's Court of Criminal Appeal was introduced, primarily as a result of the case and she was widely regarded to have been not only a victim of a miscarriage of justice but also of Jack the Ripper. Ms Delves added: "It is the only Ripper-related tour outside London and has lots of interesting stop-offs." The Maybrick trail will be led by a Blue or Green Badge Guide through the Victorian streets of Liverpool at the centre of the scandal. It begins at the 08 Place in Whitechapel on Thursdays and Fridays with extended weekend tours venturing into Aigburth taking in Battlecrease House, the Maybricks' home, and the chemist's where Florence purchased the flypapers. For more information, call 0151 233 2008 or call into the 08 Place in Whitechapel. Tickets are £4.50. Has anyone got any idea where John Lennon was buried(?) because I've never heard anybody mention it before. He wasn't. He was cremated. Think Yoko's still got the ashes. Not sure where they're kept. I was thinking he may have been cremated but that has done my head in for ages because no one knew for sure,thanks for clearing that up for me. Businessman from Liverpool. As an amateur astronomer, he became a pioneer in astrophotography. With his self-built 20-inch aperture silver-on glass mirror telescope of 8 feet focal length, he took photographic plates of the sky, intending to create photographic star charts, starting in 1885. In 1886, he took the first good photographs of the Orion Nebula M42 and the Pleiades M45 from Maghull, Lancashire. Then he moved to more southern Crowborough, Sussex and specialized on photographing star clusters and nebulae. In 1888, he obtained a photograph of the Andromeda Nebula M31, well showing its spiral structure. Roberts believed that M31 and other spiral "nebulae" were solar systems in formation, with the satellite galaxies M32 and M110 being planets in formation. Isaac Roberts published his photographes in three volumes of a series, Photographs of Stars, Star Clusters and Nebulae. The first volume was published in 1893, the second in 1899, and the third one posthumously by his widow in 1928. According to Kenneth Glyn Jones, his 20-inch reflector is now in the Science Museum in South Kensington, London (England). Issac Roberts is buried in Flaybrick Hill cemetery in Birkenhead and was the first person to take a picture of another galaxy from his home in Maghull. Yeah, it's not really what you might have expected. I got the feeling it may not have been by (his) choice, if you catch my drift. Thanks for sharing about Isaac Roberts. I love astronomy and a few years back my father got one of those several-thousand-dollar-variety telescopes for the backyard. My parents and I would have weekend coffee get-togethers where we would star gaze and take photos w/ the telescope. Of course, I would be constantly fighting with my dad - I wanted to see galaxies, nebulae, quasars, black holes, and the early universe, whereas he's more of a planet, moon, and star cluster gazer. 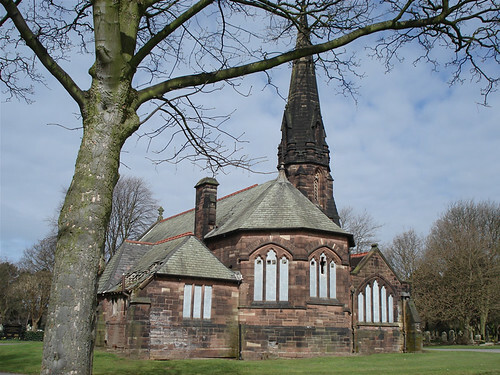 How old is Allerton cemetery ? Last edited by MarkA; 01-24-2007 at 06:49 PM. No clues there, Taffy, as to why you're asking, but that is what it is called. 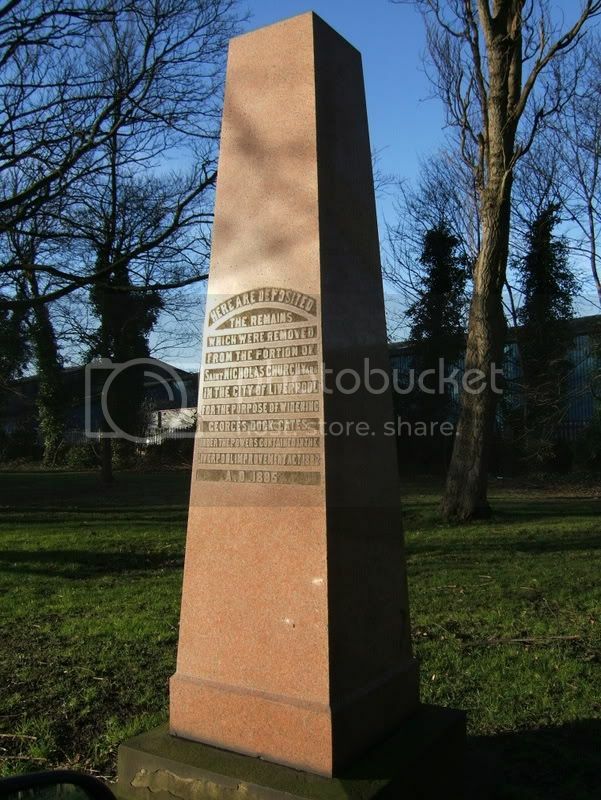 I've set up and am hosting the Friends of Anfield Cemetery website which is being designed and maintained by Pat Neil of the Friends of Liverpool Monuments Civic Society. I have released copyright so are free to use as long as credit is given. I did put two and two together Steve Nice snaps. It's surprising how different things look when you're on stilts! Great pic Philip. Always look eerie to me that cemetery. The very first post on this thread has James William Carling as being in West Derby cemetery though he's under the heading Walton cemetery with Robert Tressell. He is actually in Walton cemetery in a paupers grave. sad end for a very talented Scouser from Kirkdale. Cemetery for St. Michael's Toxteth? 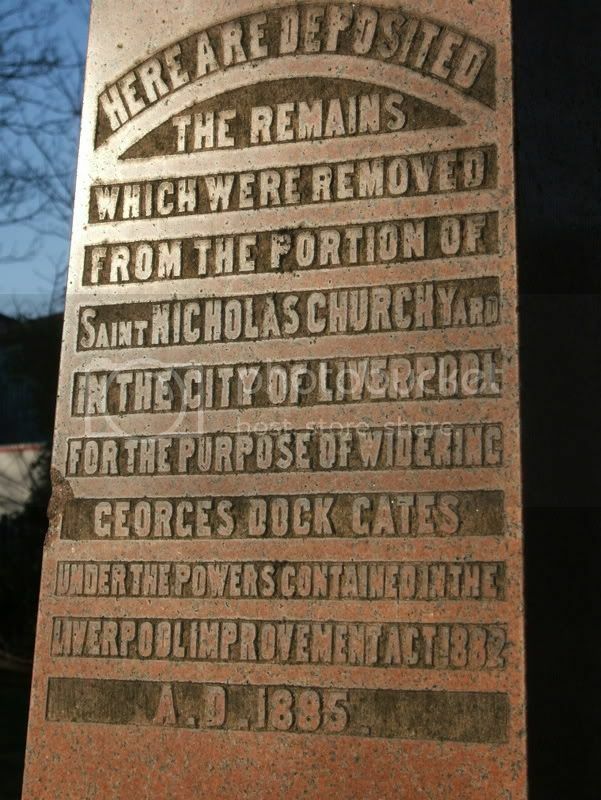 If someone attended St. Michael's, would they have been buried in Toxteth cemetery. They would have died in 1873 BTW. Also, is Dover Street anywhere near this area? The person actually died in the Nurses Home that was apparently located in Dover Street. I was just wondering if the cemetery would have a record of the burial? I doubt there would have been a headstone as she was a servant. The Monument of Sir Andrew Barkley Walker, All Saints Childwall. Sir Andrew Barkley Walker was the famous brewer who founded Walkers Brewery but he was also a patron of the arts in Liverpool - so much that he gave us the Walker Art Gallery. His monument struck me as odd for its highly Catholic looking mosaic of angels, yet this is a CoE church... odd eh? Also the grave of Thomas Moss Tate - Joseph Williamsons (The Mole) brother-in-law and a very influential businessman, a founder of the Atheneum, Botanic Garden and Liverpool Academy of Art (his father was the founder but he exhibited regularly). Strange that he's the only one of his family in the huge vault. Last edited by fortinian; 10-05-2008 at 11:31 AM. Reason: Now With Added Pictures! 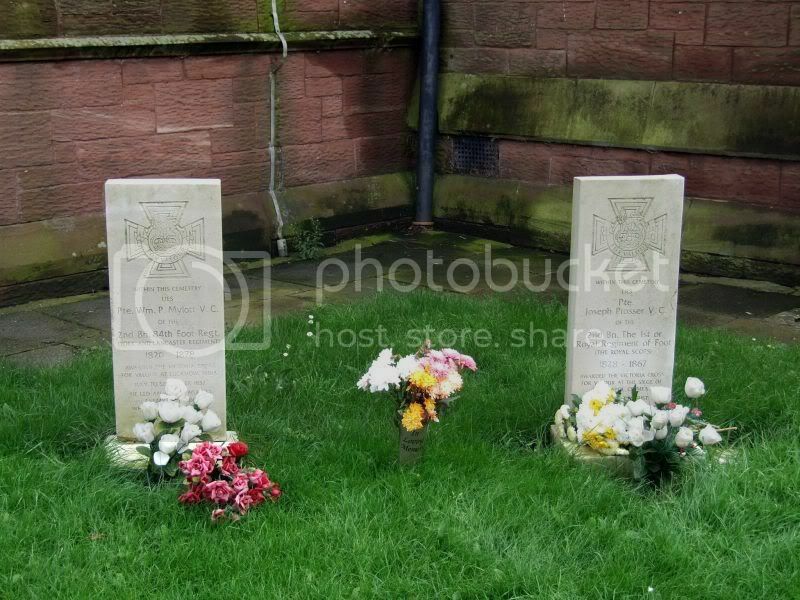 What I was thinking, but I just happen to have a pic' of Barclay Walkers grave,anyway. And while I'm at it, one in the same graveyard I thought was more effective, because of it's simplicity, and another just because of it's age! St Michael's Toxteth Park has its own graveyard attached. It doesn't follow that someone who attended the church is buried there though. Finding someone's grave is notoriously difficult in England.